Greetings judges! This week, we’re featuring a judge who has become famous not just for his skills at performing deck checks, but also his talent for performing actual magic! There may be nothing up Frank Chafe’s sleeve, but he recently earned a whopping 11 recognitions from the Exemplar Program. Let’s get to know him and his exemplary self better! Why did you become a Judge? My local game store needed a judge. Because of my background, experience, and knowledge of the game I organized a Judge Certification Night with the RC and store owner to get 6 of us certified for central California. Favourite card: Jalum Grifter – It’s the only card that my friends won’t actually let me play with because it just wouldn’t be fair. Come ask me why in person and I will show you! Least favourite card: Mindslaver – This card just creates severely un-fun situations and experiences for players, and I just scoop to it every time. Commander General: Marrow-Gnawer – Yes I play rats. 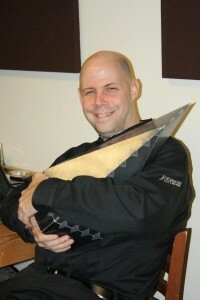 Best tournament result: Played in an Ice Age/Alliances Block Constructed PTQ with over 400 players and got 9th. Missed top 8 by 1%. Random fact about yourself: I have broken my neck twice, had hip surgery twice, and spent 12 months learning to walk again. What is your reaction to having received 11 Exemplar recognitions? I am humbled and honored beyond words to be recognized by judges I have spent the last 5 years looking up to and respecting as leaders and role models for my judge life. It’s an incredibly rewarding feeling being recognized for what I feel is doing my job as a judge. A couple of your Exemplar recognitions refer to you making mistakes and making progress in overcoming hardships. Could you elaborate on what those situations involved and how you overcame those hardships? Every event I am part of is important to me and I work very hard to make sure that I bring my very best to the event and the role/task I am asked to do. As a judge, I have fallen short of expectations of myself and others from time to time. While we all make mistakes, I tend to take them deeply to heart and it affects me profoundly when I feel I have failed the event due to my actions. I have also overcome many personal challenges in the last 5 years that have often made judging very challenging for me, and many times I have wanted to quit judging. It’s because of the wonderful judges I have in my circle of friends, and a deep desire to strive to be better at all things that I have continued to judge, and continue to pick myself up when I have stumbled. 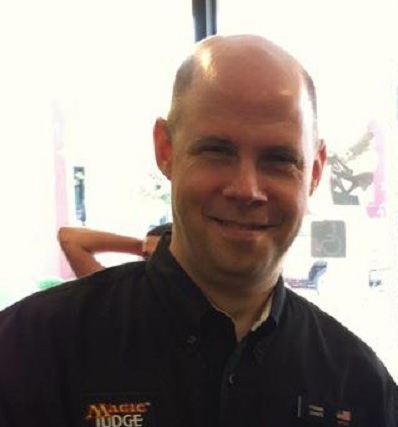 An Exemplar recognition you received from Jeremy Behunin refers to you putting together a magic show after GP Denver. How did you come to learn magic, and what are some of the tricks you can do? When I was a kid, I broke my neck skiing and was in the hospital for almost a year. I was told I would never walk again, and never regain the use of my hands fully. A doctor told my mother that if I was to get anything back, it would be because I worked with my hands every day. He suggested sleight of hand tricks or juggling for physical therapy, and that Christmas I got sets for both. For about 10 years, I had my own professional magic business. I performed shows across the western United States, and have performed all types of effects. I have now been studying/performing magic and juggling for over 25 years. You will always find me with a deck of cards or some coins, and can usually be convinced to do something magical. An Exemplar recognition you received from Eric Cheung pertained to your teaching a method to deck checks. What was your method, and how did you come to develop or adopt it? Because of my love of magic, I wanted to be actively involved in preventing cheating of any kind. Working with the decks during deck checks, I felt, was one of the best ways to do this. So I have requested deck checks at every event I go to, and I am pretty sure I have done at least 1 deck check at every event I’ve worked. I am kind of known as the “deck check” judge of my region, having given several judge talks and seminars on deck checks and cheating. As such, I don’t use one method, but actually several methods, guided by an outline I have developed and depending on the list I am given, for purposes of deck checking. Methods vary due to the deck type and the judge themselves, and I have spent the last 5 years gathering methodologies from around the globe from other judges and coming up with different methods for checking to optimize time and efficiency of movement, while still covering as many of the key areas for potential cheating. I’m always happy to talk about the subject and share ideas and strategies with other judges for helping them to be better at checks. Katie Neal ‘s recognition of you talked about your giving her advice about how to change things in Montana. What was your advice? As one of few L2s in her state, she noticed a few of the new L1’s struggling to transition from a player to judge for their store, especially at stores that prior to that had never worked with a judge, and what that new judge could do to help make the events better. I volunteered some ideas that I have suggested to others and some ideas that have been given to me. She was also having difficulty communicating her thoughts to various members of the community, from players, judges, store owners, and even her RC. I shared with her some techniques and guidelines I have learned in my time as a judge, but also in my real world roles. Learning to communicate effectively at all levels is difficult and something not all judges have experience with. In my years of work outside of judging, it has been my privilege to work and communicate with all levels of government, corporations, and small businesses. This type of communication, sometimes negotiation, and mediation is often required as a judge as you get higher in level. Sometimes, as in Katie’s case, you need people with unique perspectives guiding them to see things from different points of view, and a little thinking outside of the box, which will allow effective communication and problem solving for all parties. David Lyford-Smith ‘s recognition referred to you giving away extra playmats to newly certified L1s. How did you decide to start this practice, and how many playmats have you given newly certified L1s? While I can’t certify new judges, I do have a lot of playmats. Many new judges haven’t gone to large GPs, so may not have the plethora I do, especially playmats that are inked with “Judge” on them. When I am working with a candidate who becomes a judge, and when I become L2 and start certifying my own judges, it’s my goal to use those extra mats I have as a recognition for those judges achieving that milestone. I got the idea from my first RC Sean Catanese , who rewarded me with a judge promo from his collection when I certified. I had only heard about judge promos prior to this, so it was a nice gesture that he didn’t have to do to reward me for my accomplishment. At GP San Jose earlier this year, when all of the judges got three playmats (it was a team event and the TO was generous), I overheard David exclaiming that he was unsure what to do with all of these mats he gets at events that he would never use. I told him my idea and what I do with my mats and he loved it, saying he plans on stealing this practice for those he certifies. Cassidy Melczak ‘s recognition credited you with showing maturity and leadership in mediating potentially damaging interactions at GP San Jose. What more can you tell us about that situation? As often is the case, judges pile into a single room for GPs to help cut costs for all involved. What started out being 2 to the room, ended up being 5 in the room, with judges from all over the world. There were times when, due to jet lag/fatigue or just differences of opinion, things could have escalated without someone stepping in and defusing the situation. I was able to either navigate the conversations away from touchy topics or come up with resolutions to the disagreements so we could all get through the 5 days without incident. It was a great experience and it taught me a lot. Tasha Jamison ‘s recognition thanked you for stepping up in special ops at Grand Prix Portland and Grand Prix Salt Lake City. How did you step up at these events, and what suggestions do you have for judges who want to make a mark at a Grand Prix? At GP Portland, I was tasked with working the Prize Wall, one of the first times it was used. It went amazingly well and we were working out solutions, often on the fly, to overcome unforeseen logistical challenges. I have been involved in the prize wall ever since, and it’s been a joy to see it grow and evolve from those days at GP Portland last year. 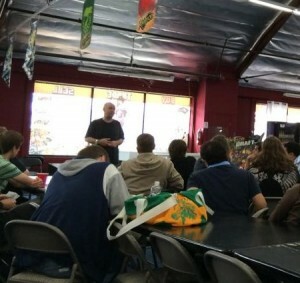 At GP Salt Lake City, I was tasked with a variety of roles at different times throughout the event because of my willingness to volunteer for new tasks. Any TO will tell you there are about 1000 things (at least!) that need to be done for any event the size of a GP. Sometimes, a few or more than a few of those things happen at the last minute, up to and including during the event itself. I learned, especially at that event, that regardless of the task assigned, that each task is important…even if you feel it isn’t. I would tell judges working their first GP that the best way to make a mark at a GP is to be the first to volunteer, last to leave, and always do the very best you can with a positive attitude, regardless of what it is. From pushing in chairs and picking up trash to sorting lands, each is important and necessary for the good of the event. Favourite is such a strong word, but one that comes to mind is one that happened recently. It was found out that I could juggle, and the discussion with a couple of players and fellow judges turned to the different things that I could juggle. One happen to have a NERF Garruk’s Axe that they had won or acquired, and I said that I could probably juggle three of those (axes) if I could get three in one place. At GP Los Angeles last year, fellow judges got together and got three axes in one place, and held me to that challenge. I managed to juggle them and get at least a few rotations accomplished. Since then, in some circles, I am known as the Apex Juggler. I was raised in a house that was very much into card/board games growing up, and as a teenager when my friends started playing this game during unlimited, they gave me a few cards and I was hooked. I started slinging cards and quickly became my community’s Mr. Suitcase and rules expert. As judges, we occasionally find ourselves rushing to a judge call then rushing to answer a rules question then rushing to move on after the call. Being a judge has taught me, and continues to teach me, patience. Patience with my words, my actions, and with people. I enjoy helping to make great events for players, judges, TO’s, basically everyone. I enjoy seeing the growth in players who ask me about rules interactions and use it to become better. I value time spent with other judges in discussion about best practices used across the planet for events and we all going home and utilizing the shared knowledge and skills we have learned. I enjoy working with TO’s and assisting in preparing and executing the event and bringing my event planning skills to the table. I also enjoy working with the different venues events have to insure that when the event is done, the venue wants us back. Don’t underestimate the power of your opening announcements for all levels of Magic events. Your announcements will help bail you out of sticky situations that can creep up on you later in the event. Prepare the announcements in advance, utilize a script or notes if you have to. The better your announcements are, the better your event will run. Don’t skip them just because it’s FNM, and people have heard them before. Going to dinner with Cristiana Dionisio and other judges after GP Phoenix, I had just met her for the first time, and she asked if I would join her and other judges for dinner. She found out en route to the dinner that I use to be a professional magician and quickly asked if I could perform a little. I don’t know about you, but seeing an L4 giddy as a school girl over a few little tricks like vanishing a salt shaker was something I will always remember. I was playing at a large tournament for a convention back in the mid 90’s and made the finals. In the last game of the match, I spent some moments working out a tough play and came to the conclusion that if he had a counterspell, which he was representing, that I would lose the match. I leaned back in my chair and looked up and noticed that the ceiling to the ballroom we were playing in was mirrored. I could tell he had no blue cards in his hand, and I played my card which allowed me to win. I said good match, extended my hand, and offered a split. When he gave me a puzzled look, I said to look up. He did and we both laughed. Was it cheating? Maybe. I’d like to call it taking advantage of my surroundings. We have both talked about it and shared the story over the years and we still laugh when we do. How no one noticed till the final round was beyond me! GP Denver. 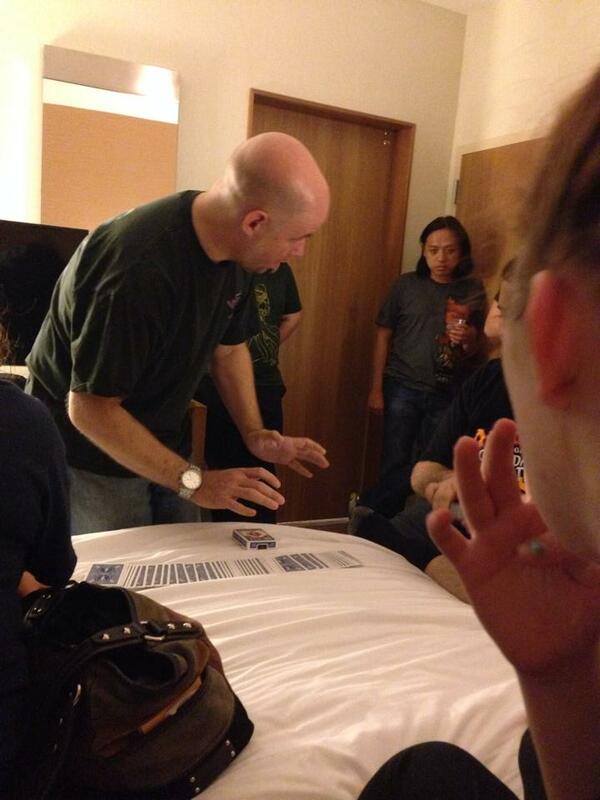 I was on Deck Checks all weekend, but several times throughout that event, I was called upon to help assist in potential suspected cheating situations because of my background as a magician and knowledge of card manipulation. It was a lot of fun, challenging, and the HJ thanked me and recognized me for my efforts. It was incredibly rewarding. I hear there really great magic show at the end of it…. I would talk with Dai Vernon, the Professor. 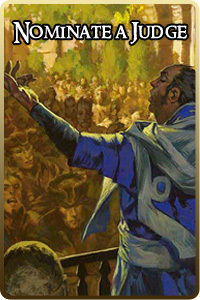 Vernon was and is considered to be the best and most knowledgeable magician to ever have lived. There’s often stories of him just sitting at a table staring at a deck of cards, and the cards would shuffle and do things without him moving. His slow motion card vanish is a work of art. While these are just stories, the things he could do…still amaze me to this day, years after his death. What would you be doing now if Magic: the Gathering no longer existed? Magic. I’d probably practice and perform magic more than I do, and probably still be performing. I’d probably also be a circus performer and a renaissance faire worker full time. It doesn’t happen often but I find it fascinating when players create a stack of spells and triggers, and then let part of it resolve and then put more things on the stack. I have only seen it twice at tournaments and both times one of the players has called me over to ask if it was possible. Deck Checking. Its oddly relaxing for me, and I enjoy finding the strangest things in deck boxes, on deck lists, and working and talking with judges on techniques for deck checking. Target player shuffles his hand and graveyard into his library. Replace those cards with cards of your choice from that player’s deck. Putting on the black shirt for the first time. Wearing that black shirt is like putting on a suit of armor. It’s the first time I truly felt like a judge, and I still get excited when I get to wear it. My region needs more L2s and it’s my goal in the next year to get there. I should be there already and I have wanted to get there, but life has gotten in the way of that. I hope to change that, so that there are more qualified judges to run the copious amounts of PPTQs in our respective region. It’s a need in my community and I feel it a responsibility to help in this area, and to accomplish my own goal of becoming L2. I also have had many judge candidates approach me in the game stores I work at asking me for help in becoming a judge. I would like to take a more active role in assisting those that come to me, through the entire process of leveling, rather than send them off at the last moment to an L2 who they might never have met prior to the test, in order to pass that last hurdle and become a judge. The next 5 years I hope to do many things towards L3, including Team Leading a Deck Check team at an Open or GP, HJ larger events, and take a more active role in the education of judges. I feel I have a lot to offer in certain topics and areas, and can bring a wealth of experience and knowledge to those discussions. There’s a community of people that are the judge program. People that I have come to know, respect, admire, and call friend. I wouldn’t, couldn’t, be the judge I am today without them. In many respects, I wouldn’t be alive today without them. I feel blessed by the opportunities that I have been afforded, the friendships I have found, and the tools I have learned…so much so, that I feel it’s my responsibility to give back, to give opportunities to people, be a friend to fellow judges, and give of my experiences and the tools I have and have learned, to the program and judges. I judge so that all may play in a fair environment. Where rules and players are respected, and in turn a great event is had by all. I hope that my presence, my participation, and my philosophies will affect the world of magic and help keep it a world of Planeswalkers and players, and not one of manipulators and cheats. If you are reading this, I encourage you to judge for the love of judging, because you love the game, and for the respect of the people involved in both. I know I do. I hope you do as well. “Two Truths and a Lie” – Which of these facts about Frank is fiction? I have written three film-ready screenplays, that aren’t yet movies. 1 based on a book, and 2 are original stories. I have been to every state in the union, and my favorites are Wisconsin, Idaho, and Maine. In my time working at hotels, I have seen dead bodies being operated on, drug busts, my hotel catch on fire, a mafia takeover of a hotel, and been shot at. Miguel is not banned. In fact, he says he rarely wins much of anything, but still has a great time!